The 105-story Ryugyong Hotel has long been a blot on the Pyongyang skyline. The world's tallest unoccupied building has towered over North Korea's capital since 1987, a grand but empty pyramid entirely dark except for the lone aircraft warning light at its top. 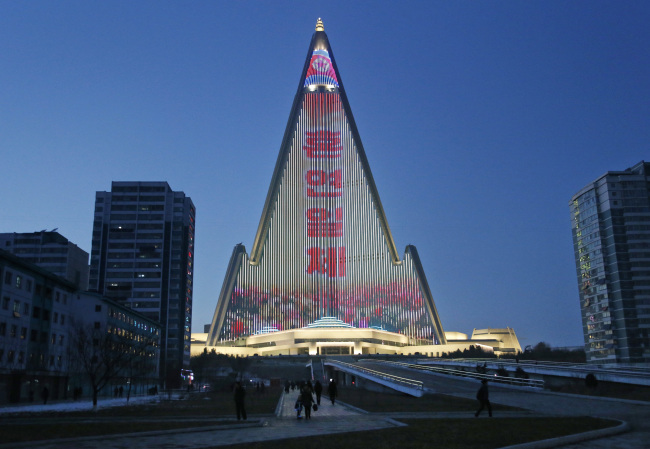 The display was first lit in April to mark the birthday of the country's “eternal president,” Kim Il Sung. Giant LED displays has been used around the world for many years _ and on an even bigger building. Japanese designer Yusuke Murakami and a London-based company collaborated in 2016 on an LED animation on Dubai's Burj Khalifa, the world's largest tower. Like his father, Kim Jong Un has a penchant for ambitious building projects, including 82- and 70-story residences in the capital's “Ryomyong,” or “dawn,” district that opened last year and a massive science and technology complex with a main building shaped like a giant atom. “That's not my field,” he laughed.